Umbrella Softboxes provide the features of a softbox with the ease of set-up of an umbrella. 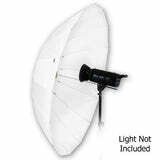 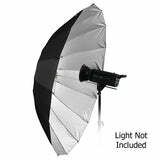 The uniquely designed reflective umbrella softbox is great for photographers on the go; perfect for location shooting, installation is simple and instant, similar to using a studio umbrella but with all the benefits of a softbox. 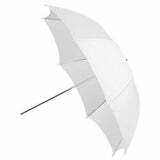 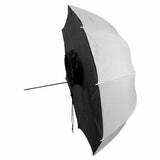 The umbrella softbox is made with high quality reflective and diffusive materials for long lasting use. 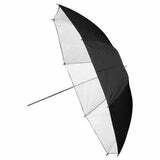 The black exterior dome features a silver concave interior lining for maximum light reflection with white diffusive nylon material across the umbrella opening to diffuse and soften a light. 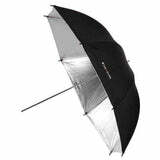 The opening in the nylon cover which the umbrella shaft passes through also has a drawstring closing to fit almost any sized flash or strobe allowing all light to be trapped and reflective efficiently.